No starfighter is as ubiquitous in Rebel squadrons as the T-65 X-wing. With its astromech droid finely balancing its firepower, shielding, and maneuverability, the T-65 is capable of taking part in almost any Rebel operation. As a result, the ship is a fixture in the space battles of the Galactic Civil War, becoming an indelible symbol of the Rebellion itself. When X-Wing™ Second Edition launches later this year, you’ll have the chance to launch your own group of T-65 X-wings into the next evolution of space combat with both the Core Set and the T-65 X-Wing Expansion Pack. 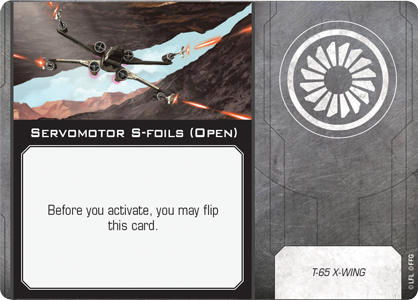 Order your own copy of the T-65 X-Wing Expansion Pack at your local retailer or online through our website today! 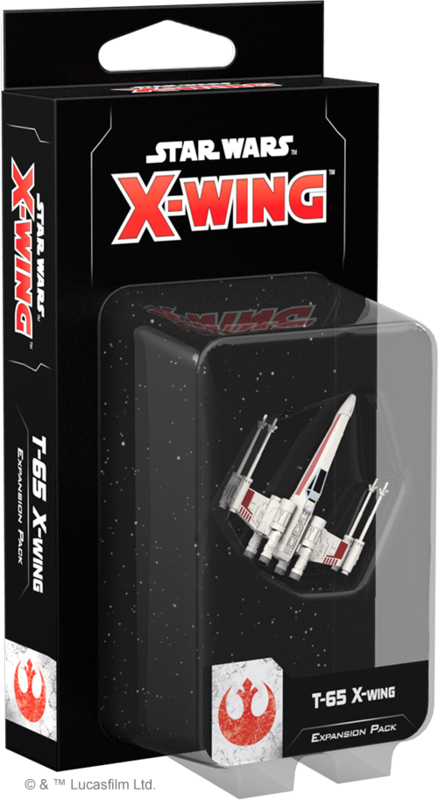 The T-65 X-Wing Expansion Pack contains a fully-assembled, beautifully painted miniature featuring moveable S-foils that can easily transition between closed and attack positions. 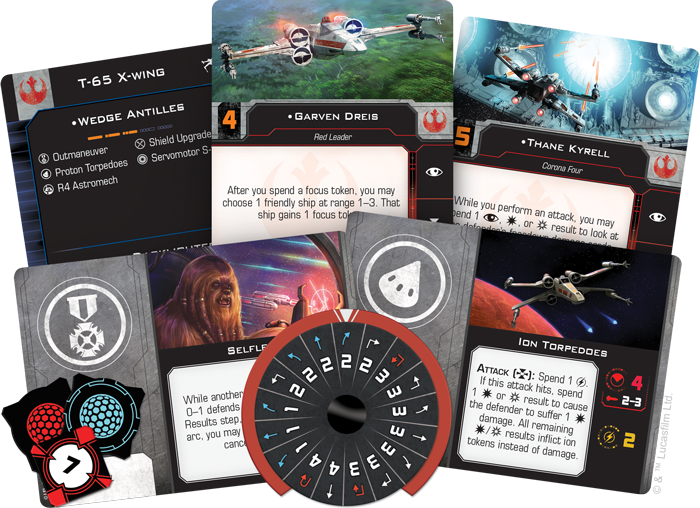 Additionally, the expansion also includes the tokens, cards, and maneuver dial you need to incorporate another T-65 X-wing into your squadron. 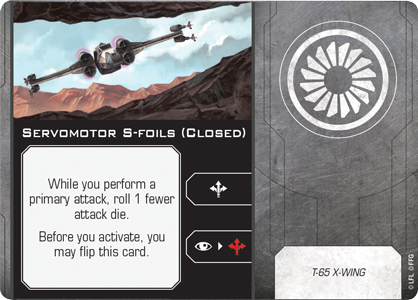 Veteran players can bring their existing T-65 X-wings and other ships from the first edition into X-Wing Second Edition with the ship tokens, cards, and maneuver dials included in the Conversion Kits available at launch. New players, on the other hand, can grow their collection with the six ship expansions launching alongside the T-65 X-wing Expansion Pack and the Core Set. All of the ship and upgrade cards contained in the T-65 X-wing Expansion Pack will also be present in the Rebel Alliance Conversion Kit. The T-65 X-wing was a mainstay in Rebel squadrons during the Galactic Civil War, and for good reason. These starfighters played an integral role in the destruction of both Death Stars, their pilots bravely taking part in both missions despite the long odds. With a strong list of available actions and a wide range of options for upgrades, the T-65 is a great all-around fighter capable of playing many roles within your squadron. In our announcement, we already revealed that the Servomotor S-foils upgrade unlocked new possibilities for the T-65 depending on whether its S-foils are open or closed, giving you access to more actions and deepening the ships’ tactical flexibility. 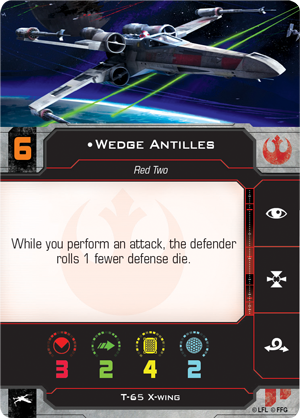 Additionally, when we previewed the refinements to movement made in X-Wing Second Edition, we discussed how the T-65 was more maneuverable than ever with the addition of speed-three Tallon Rolls. But these aren’t the only tweaks made to the T-65 for X-Wing Second Edition. The ship is now a bit heartier, with four total hull. It’s also a bit more maneuverable, with the barrel roll added to its action bar. The result is a powerful fighter that will take a concerted effort to bring down. Beyond these upgrades, though, the T-65 X-wing can fill a much different role on your squad depending on who's flying it. Fortunately, it's the ship of choice of some of the Rebellion’s best pilots, including the legendary Wedge Antilles. 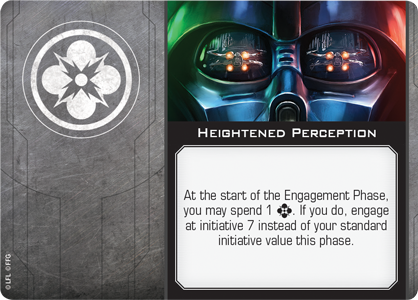 As an ace starfighter pilot, Wedge’s initiative value of six means he’ll fire before everyone except pilots aided by the power of the Force. When he does shoot, he can zero in on his target with uncanny accuracy, forcing the defender to roll one fewer defense die. But even a pilot as good as Wedge Antilles needs wingmen to support him, and the other members of Red Squadron can give him the help he needs. 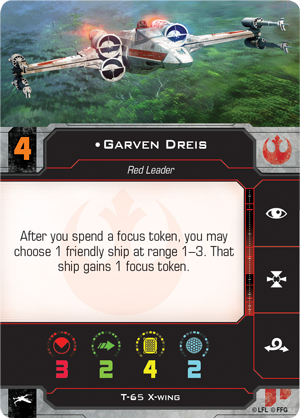 Garven Dreis, for example, can send Wedge a focus token that could be used to modify his defense dice and fend off an incoming attack. 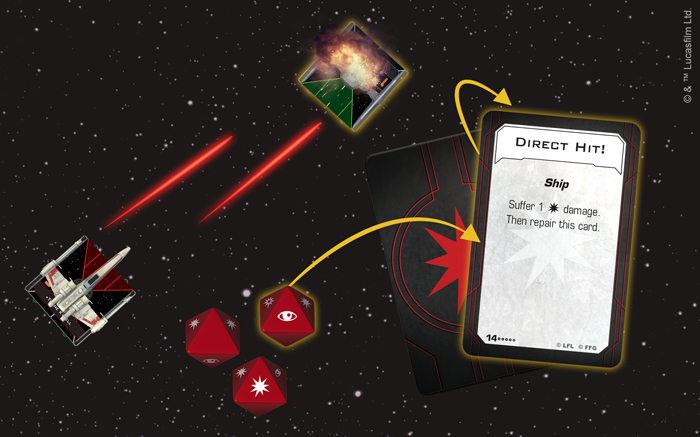 Better yet, Biggs Darklighter can draw enemy fire, soaking up damage to cancel attack dice intended for another ship. 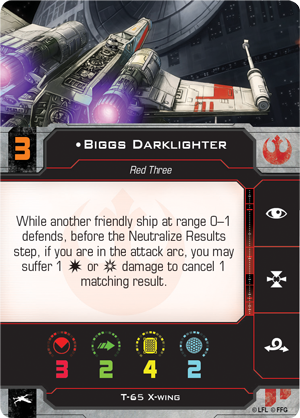 You can also choose to make Biggs Selfless, giving him the ability to suffer both one normal and one critical damage result in place of a friendly ship during a single attack. Looking outside of Red Squadron, X-Wing Second Edition sees the introduction of a brand new T-65 pilot. Known for being an ARC-170 pilot in the first edition, Thane Kyrell seamlessly makes the transition to the Rebellion’s signature starfighter. 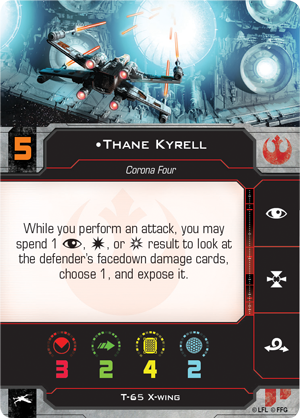 While he’s launching an attack with his T-65 X-wing, Kyrell can sacrifice one of his non-blank dice results to look at the defender’s facedown damage cards and expose one of them. Spending this result could be well worth it if he flips a Structural Damage card, for example, forcing the defender to roll one fewer defense die. 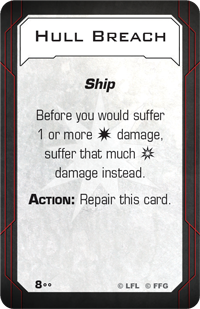 Kyrell could also enhance his attack with critical damage by opening up a Hull Breach, potentially adding even more faceup damage cards to the defender without even rolling critical damage. 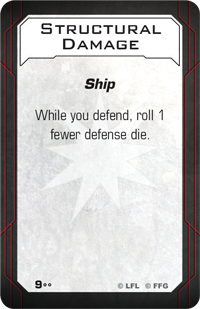 Finally, if one of the facedown damage cards happens to be a Direct Hit!, he could just finish off an enemy ship right there. 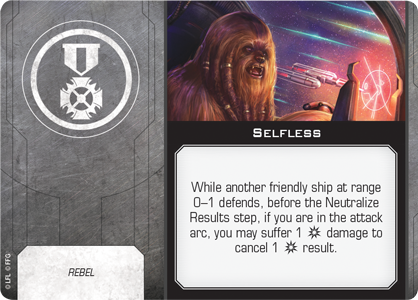 Thane Kyrell spends a focus result to expose the TIE fighter's Direct Hit! 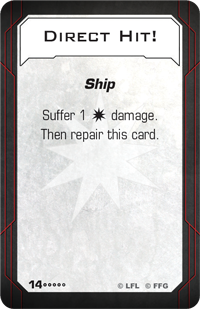 damage card, adding another damage and causing it to be destroyed! In addition to a diverse array of pilots to choose from, the T-65 also features a number of upgrade slots that can be used to further customize the ship. 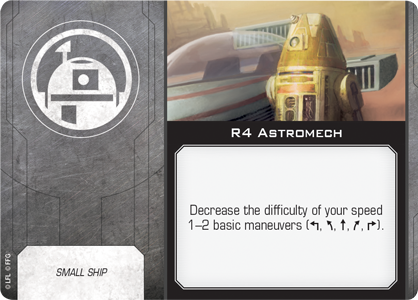 Astromech droids, of course, are some of the most versatile upgrades in the game, providing benefits ranging from shield recovery to enhancing a ship’s target locks. A droid like an R4 Astromech adds navigational assistance to this list. When installed on a T-65, even speed-two turns become blue, allowing you to both perform pinpoint maneuvers and remove stress. Beyond astromechs, T-65 X-wings are also famous for using torpedoes during the battle of Yavin. There are more options for you to explore beyond the standard proton torpedoes, however. You could easily add some Ion Torpedoes and pepper an enemy ship with ion tokens. 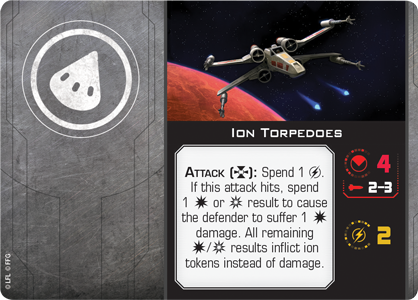 If you add enough of these ion tokens, you’ll make that ship a ripe target for the next round by forcing it into a speed-one straight maneuver. If the Rebel Alliance is planning a combat operation, the T-65 X-wing is sure to be there, bringing with it the hope of the Rebellion. Get to your ships, take to the skies, and start your own rebellion! The T-65 X-wing Expansion Pack (SWZ12) is launching alongside the X-Wing Second Edition Core Set on September 13th, 2018. Pre-order your copy at your local retailer or online through our website today!